With the Vancouver Canucks long gone from the playoff picture and looking towards the NHL Entry Draft, it’s time to start looking at some potential targets. It’s no secret that the Canucks are in dire need of a defenceman, and there are plenty of blueliners for them to look at in the upcoming draft. Rasmus Dahlin is the apple of everyone’s eye, but who should the Canucks grab if they don’t luck out at number one? 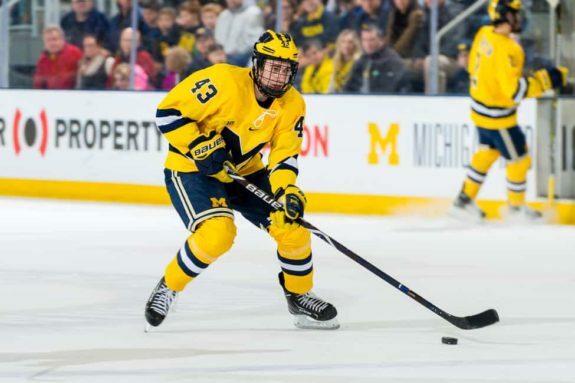 If they’re looking for someone who has hands as soft as Dahlin’s, then maybe they should look at Quinn Hughes. Dynamic speed and other-worldly skill are both big factors in the game Hughes plays. Despite falling behind a few other defenders on most rankings, you could argue that he has the most skill in this draft aside from Dahlin on defence. Hughes isn’t your typical ‘walk the line’ defenceman. That often becomes a compliment for defenders who control the puck from the blue line in the offensive zone. Instead, from Hughes, you see a lot of pinching with the puck in his game. That might be a factor in why scouts decrease the value of his game behind guys like Adam Boqvist and Evan Bouchard, but Hughes has shown that he doesn’t often make mistakes. On defence, he uses his quick stick to check oppositions in his own zone. He’s also so quick that he doesn’t get hit very often either. It still waits to be seen how he would adjust at the NHL level, but he’s showing promise to get himself out of trouble with ease. In his own zone and in transition, Hughes uses his dynamic speed in order to make things happen. He almost always has his head up, and doesn’t panic no matter what the situation is. He likes to pass more than he likes to shoot, but there aren’t many players at his level who can find guys in tight spaces. So far, he’s been able to put up points at every level, although he did slow down at the World Juniors after a strong opening game. While defenders like Evan Bouchard and Noah Dobson seem to be receiving more love, they are safer picks. Hughes has size going against him, but he has skill in spades. A comparison to a player like Torey Krug might only be the floor for a player like Hughes. Is Hughes’ Wonky Ranking an Issue? There are always players in every draft that turn out to be somewhat divisive, and Hughes might be one of those. For the most part, Hughes seems to be rising on most rankings, but he doesn’t have a concrete spot on any expert’s charts. As long as the Canucks hang around the bottom five, it looks like they won’t draft any later than eighth overall. That would be an extremely disappointing result considering their season, but is it still too high to draft Hughes? According to some rankings, it would be. It still seems like the size bias is one of the main things holding Hughes back in rankings. At 5-foot-10, 170 pounds, there’s no doubt that Hughes is on the smaller side. Does that still matter in today’s NHL? The trend that we’re seeing in the NHL is that size matters less. There are a plethora of successful defenders in the league who could be defined as slight in stature. Guys like Krug and John Klingberg come to mind. Even Erik Karlsson, one of the best defenders in the game, checks in at 6-feet, 190 pounds. From watching Hughes’ highlights, he’s also a slippery player on the ice. There aren’t many defenders in his age group who play with their heads up as much as he does. He seemingly always knows when to pinch and when to retreat. The question remains, will he still play that same game at the NHL level, when everything is quicker and there’s less room to maneuver? Scouts who rank him lower must have those questions, but it hasn’t done much to hurt his stock over the past couple months. What do you think? As a Canucks fan, would you like to see Quinn Hughes as a Canuck if they miss out on first overall?